The strong 11litre Igloo cooler bag has the ability to hold 24 can and can also be used as a seat. When used as a seat, it can hold up to 90kgs. The strong and good quality 600D polyester material has been used in its manufacture. It has an aluminum foil fitted with a laminated PE foam insulation. These products have an exclusive base which can be removed. This option gives it the ability to fold flat which makes it convenient for traveling and storage while not in use. 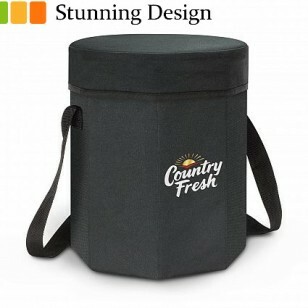 This appealing logo decorated chiller bag is designed for easy assembling and folding. The walls of this cooler have been strengthened using plywood and the seat is made of soft padded material. The shoulder strap is adjustable and it comes in the color black. Give your potential clients something they will treasure over and over again. The price listed for these promotional products includes a one colour print in one position onto them. There is an additional print set up fee of $75+gst for each colour. GST is additional. When you supply your artwork file, please email through an EPS or AI vector file. Our production turnaround time is 2 weeks from when you approve the final artwork mock up. Once printed they are bulked packed and couriered to your office anywhere in Australia. Delivery time will vary depending on which Australian state your wish to have it sent to. To find out more please contact us.